Print - Cheap Handbags, Fashion Leather Handbags, Free Shipping! Yesterday, we’ve featured the Prada Butterfly Printed Bag Collection, which consists of some fab pieces you can sport however you want. Today, we’re introducing another quirky set, in the form of the Prada Lipstick Print Bag Collection. These pieces immortalize the glory of our favorite tube of goodness – our prized lipstick! Beauty-themed decor is all the rage these days, which has long been spotted on our favorite brands and their collections (Saint Laurent, anyone?). These bags are oh-so adorable, you’d want to wear them along with your wardrobe pieces. 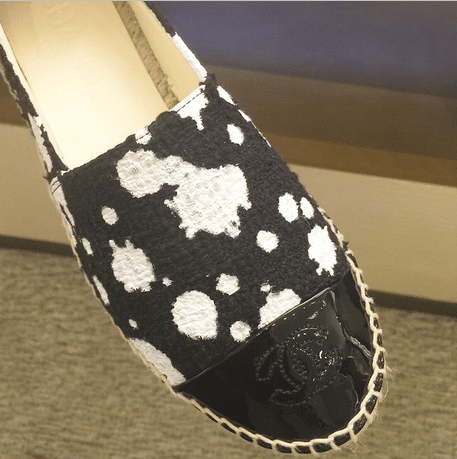 Just like their Butterfly counterpart, they also come in fine Saffiano leather, which is a very luxe material that could stand the challenges of wear and tear. Trust us when we say that these bags are keepers! If you’re looking for an unexpected, out-of-the-box choice, then look no further – Prada has you covered. Get yours now via Bergdorf Goodman. 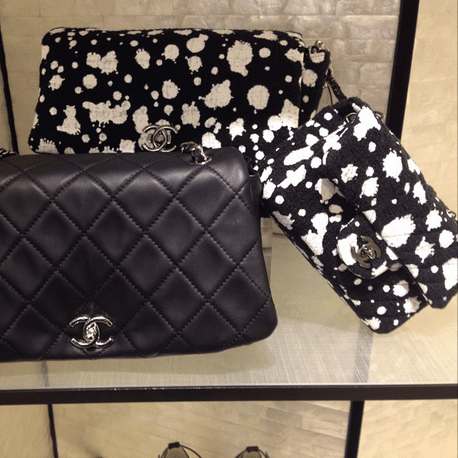 Today, whenever you see black and white in fashion, you will think of one brand: ‘Chanel’. Perhaps the inspiration of the ‘Paint Splatter Print’ came from Coco, or from the famous 101 Dalmatians movie. You need learn to appreciate the story of this bag in order to love it. This print was first-shown at the Spring Summer 2015 Runway. It’s like the Classic Flap Bag with the CC logo, the flap and the interwoven chain links. The bag is made from Jersey and not leather so it should be less expensive. 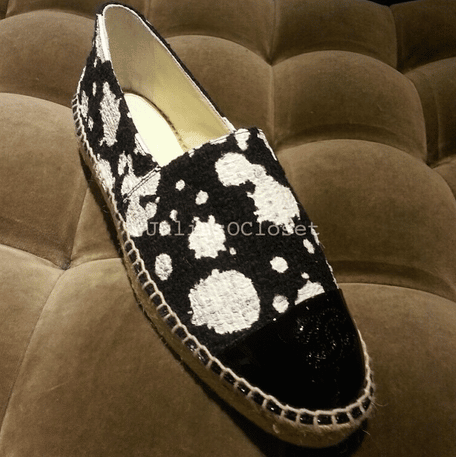 The Paint Splatter Print is also available in Espadrilles and it’s crafted from Tweed. And if you can purchase them both, you will have matching outfit. 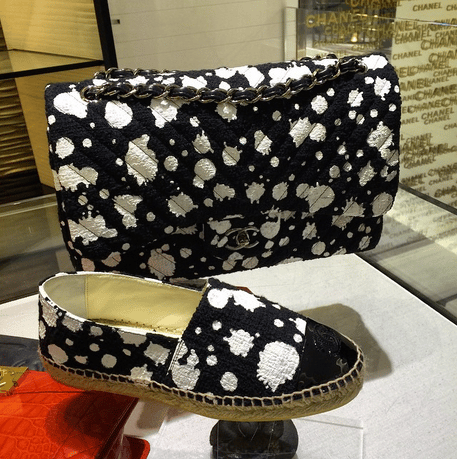 Chanel Paint Splatter Print Flap Bag is priced at $3400 USD and the Paint Splatter espadrilles is priced at $725 USD. Available via Chanel boutique. 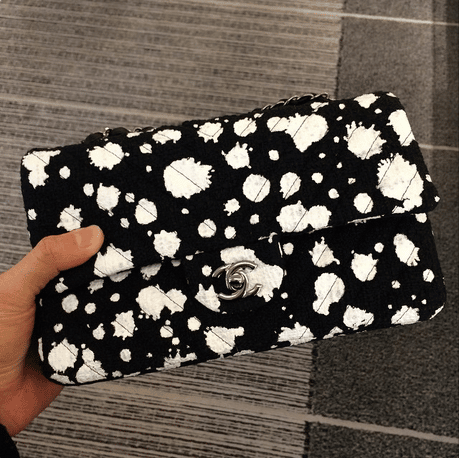 Chanel’s newest print design is the paint splatter in black and white. This print was featured in the Spring/Summer 2015 Runway show, where multiple colors were also presented in the runway. This print comes in flap and messenger bags, and also in espadrilles. 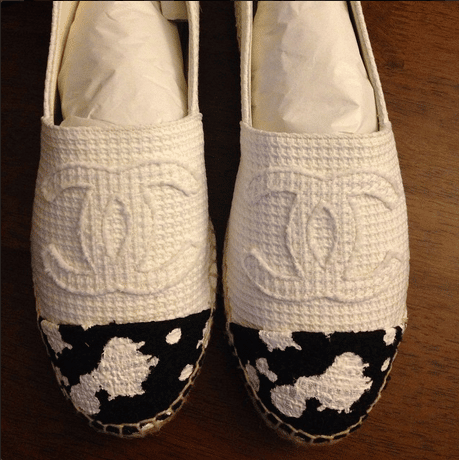 The bags are made of jersey fabric, while the espadrilles are made of tweed. The espadrilles are featured in two combos, one with white and printed toe, and another with the entire shoe in the new print. Feel the summer, when the nature starts to dress in floral, you should too. 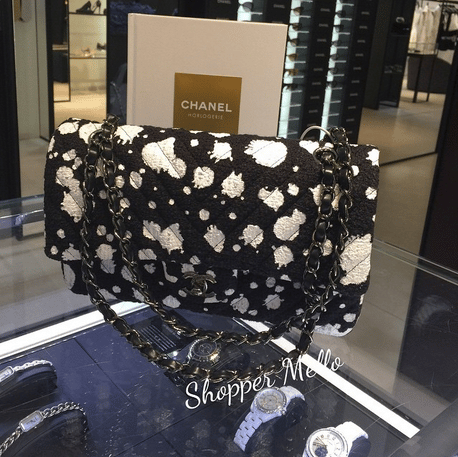 I fell in love when I spotted the Dolce & Gabbana Rose Shoulder Bag. I know, it’s different than the usual black we love. It’s sophisticated and can only be worn in special occasions like party’s or events. But your wardrobe is not complete without it. Floral prints are all over the bag in tones of green and red. Or if red is too much, how about in tones of green, yellow and white? The flowers are carefully put on the bag like a work of art, making it as real as possible – like its alive. It comes with a chain shoulder strap, a small logo plaque on the front in gold-tone and silver-tone metals and a zip pocket in the interior. Measuring 8.5’ x 5’ x 2’ (L x H x W), priced at $700 USD via SSENSE.